Dentures have clear advantages when all of your teeth are missing. But if the dentures are removable, you might be concerned that they slip in your mouth, can fall out and embarrass you or more seriously, they don’t prevent jawbone shrinkage. If you want to consider an option that makes your dentures more secure, but is not as costly as getting individual dental implants for each tooth, take a look at implant dentures from New Orleans cosmetic dentist Dr. Duane Delaune. With implant dentures, two or more root forms made of titanium are surgically placed in your jawbone. 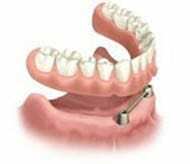 In some cases, a retainer bar joins the implants for added stability. Depending on the implant technique that you receive, the jawbone is allowed time to heal around the root form. You’ll have a try-in of the dentures to ensure that they fit properly. Then, the dentures are secured to the implants. They prevent jawbone shrinkage that leads to facial collapse. You don’t have to worry about them slipping in your mouth or falling out. They are less costly than individual implants, for which the cost is per implant. They are more comfortable than removable dentures. Your chewing efficiency will improve, when compared with removable dentures. They cost more than removable dentures. You may have to wait several weeks for your gums to heal before the dentures are secured to the implants, but you’ll wear transitional dentures while you wait. 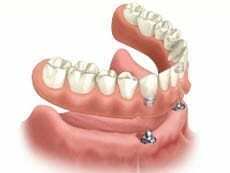 You should not leave the placement of implant dentures to chance. Implant mistakes can occur, including infection, loosening of the implants and nerve impairment. Dr. Delaune has received post-graduate training in implantology from Russo Seminars and the Zimmer Institute. He will ensure that your implants are correctly placed. Dr. Delaune will also apply his training in cosmetic dentistry to create a beautiful, natural-looking smile for you.